Flight control is a great game for the ipod touch and iphone. It is one of the best that I have played on the system and could not be done as well without the touch screen interface. Flight Control has really found a home on the ipod touch. In Flight Control you are put in the role of an air traffic controller. 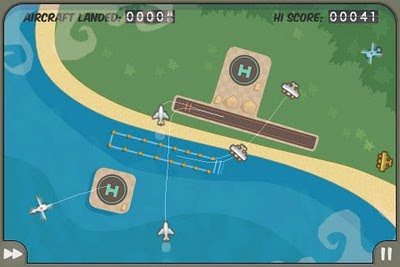 Planes and helicopters fly onto the screen and you need to give them a path to their correct runway or helipad. It is done by simply touching the plane and drawing a flight path - with your finger - to the runway entrance. There are different maps to play on with varying numbers of runways and different types of aircraft. High scores are tracked for each map. That's really all there is to it, but the game quickly ramps up the speed and number of aircraft on the screen as time goes on. It gets frantic but it's extremely fun. This is an easy to understand game that can be digested in small sessions - you know how I love 60 second games - with lots of replay value. I can't recommend Flight Control enough as an essential app for your iphone or ipod touch. Is there an iPad version? Could get even crazier with more screen real estate. I played the ipad version in the apple store the other day. It doesn't ramp up as quickly because there is so much more screen space. It looked like a solid game though.